"It's the best show in town and if you haven't already booked, act quickly and treat yourself. You will love it." "Broadway Hitmen is the ultimate opportunity to see world class talent, right here, on your doorstep"
"... featuring performances that could easily be at home on Broadway or the West End." Broadway Hitmen follows on from the grand success of the 2017 mid-year concert An Evening of Rodgers and Hammerstein Classics. Orchestra, soloists and a large chorus will fill the Isaac Theatre Royal stage to present a concert of back-to-back hits from two of the biggest names in musical theatre, Cole Porter and Andrew Lloyd Webber. American born Porter wrote the music and lyrics of over 800 songs during a career spanning five decades, conquering both Broadway and Hollywood. He was renowned for soaring melodies, offset with urbane and witty lyrics giving rise to his signature musical genre known as ‘the Cole Porter song’. His full length musicals remain classics on stage and screen with icons like Anything Goes, Can Can and Kiss Me Kate finding new audiences with every decade. Many of his greatest songs, such as ‘Night and Day’ have endured, covered by modern stars: Michael Bublé, Robbie Williams, Lady Gaga and many more. British born Andrew Lloyd Webber is arguably the best known name of musical theatre in the modern world. In 2017 he became the first composer to have four musicals playing simultaneously on Broadway since 1953. Webber has composed some of the world’s most beloved and successful musicals including Evita, The Phantom of the Opera, Jesus Christ Superstar, CATS and Sunset Boulevard to name just a few. Broadway Hitmen features favourites from these two musical theatre hit makers performed by the Ryman Heathcare Showbiz Christchurch Orchestra on-stage and under the baton of Ravil Atlas, along with soloists and a large chorus, with stage direction by Nickie Wellbourn. A Concert featuring full concert orchestra, soloists and a large chorus. Back-to-back hits from two of the biggest names in musical theatre! Evening performances: Friday - Saturday 7.30pm. Matinees: 2pm Saturday 14 July; 4 pm Sunday 15 July. Duration: 2hrs 15mins (including a 20min interval). Starting from $60 (includes GST, a $2.50 ITR Heritage Levy and Ticketek service fee). Sectional Musicians: Carlo Ballara, Georgina Rees-Stevenson, Craig Given, Chris Petch and Matt Oswin. It's a full house of mixed ages in the history-steeped, gloriously refurbished Isaac Theatre Royal. On stage is an orchestra of thirty musicians under the masterly guidance of Musical Director Ravil Atlas. Strings, percussion, keyboards, woodwind and brass are positioned to allow two paths to converge on centre stage. Dressed in black the players provide the spirited yet self-effacing foundation, the musical framework for the soaring vocals and unfolding vignettes. Showbiz Christchurch can be relied upon to pull off rewarding shows; however, Broadway Hitmen is a world-class extravaganza which presents wave after wave of delight and joy. With live musicians, a full choir of fifty voices, a dozen tap dancers and more than a dozen featured soloists, this is a celebration of the music of Cole Porter (Act One) and Andrew Lloyd-Webber (Act Two). They say the ideal is to enter a musical being able to hum the tunes; and this is certainly the case. The introductory overture leads into a rousing ‘Another Opening Another Show' combining all soloists and chorus. It's a great move – punchy, collaborative, powerful – and we know we're in for a thrilling night. Got run down by an avalanche? Next July we collide with Mars? Comic singers are not always given their due. Blair McHugh and Matt McMenamin own the stage with ‘Brush Up Your Shakespeare', and Anne-Marie Cotton and Warwick Shillito are utterly charming in ‘Let's Do It'. With musical panache in well-lit settings, hits from Kiss Me Kate, Out of This World, High Society, Gay Divorcee and Anything Goes roll along seamlessly. Everyone on stage is at the top of their game. There's a natty medley of ‘I Love Paris'/'Begin the Beguine'/'Night and Day'/'I've Got You Under my Skin'. ‘Anything Goes',led by Kira Josephson and colourfully supported by a dozen delightful tap dancers, is the brilliant culmination to Act One. And then it gets better with the potent Act Two opening of ‘Masquerade' from Phantom of the Opera followed by a stunning tour de force solo of ‘Think of Me' by Charlotte Taylor in which we are also treated to the pure velvet voice of Nic Kyle. Where Cole Porter's music is light, melodious, at heart mercurial, the music of Lloyd Webber is dramatic, passionate and essentially theatrical. The orchestra plays a rollicking ‘Jellicle Ball' (Cats) which, at its conclusion, transitions into a hallowed offering of ‘Pie Jesu'from Requiem, featuring Amanda Atlas and boy soprano Oscar Stove. The haunting melody arrests the hushed theatre and receives resounding applause. With so many stand-out performances it would be ungracious not to name all of the soloists: Amanda Atlas, Anne-Marie Cotton, Blair McHugh, Bryony Jamison, Catherine Hay, Charlotte Taylor, Donna Alley, Jack Marshall, Jacqueline Doherty, Kate Taylor, Kira Josephson, Leigh Wilson, Matt McMenamin, Nic Kyle, Oscar Stove, Sophie Gilmore, Tara Martin, and Warwick Shillito. Bryony Jamison's heartfelt vocal of ‘Don't Cry for me Argentina' (Evita) is riveting and I feel anxious for the performer who has to follow. Then Catherine Hay enters quietly, left of stage, sits on a lonely park bench and offers the finest rendering of Tell Me On a Sunday's title songthat I have ever heard. Both songs are show stoppers. The plateau of excellence and the hits keep coming with ‘As if we Never said Goodbye'from Sunset Boulevard (sung sensationally by Amanda Atlas). From Jesus Christ Superstar:‘I Don'tKnow How to Love Him' (Catherine Hay); the heart wrenching ‘Gethsemane' which parades the comprehensive range, pitch, tone, and emotion of Nic Kyle's superb voice. The show culminates with Kate Taylor, Leigh Wilson, Catherine Hay, and a full chorus offering of ‘Superstar'led by Jack Marshall. The air is heady. Broadway Hitmen rightly receives a standing ovation and no-one wants to leave. Ravil Atlas as Musical Director and Nickie Wellbourn as Staging Director have orchestrated a comprehensive world-class entertainment. It's the best show in town and if you haven't already booked, act quickly and treat yourself. You will love it. Showbiz Christchurch left audiences spellbound with their recent production of the popular musical Wicked. In fact, Showbiz have been raising their own bar so high, consistently producing world class productions of smash hit musicals, that the height of that success is dizzying! Broadway Hitmen is yet another triumph for Showbiz Christchurch. This concert of much loved hits, from musical theatre heavy weights, Cole Porter and Andrew Lloyd Webber, reaches all the right notes. This musical celebration of two iconic, male composers (the hitmen), is as much a celebration of the overwhelming abundance of immensely gifted performers, and musicians that Christchurch has to offer. For a relatively small city, Christchurch has a thriving musical theatre scene. This was made abundantly clear, as the opening night audience delighted in a concert that truly showcased some outstanding local talent. Broadway Hitmen was, to borrow a phrase from kiwi sporting vernacular, a show of two halves. The first half showcased an array of songs by Cole Porter, a hero of twentieth century song writing. The second half comprised of hits by Andrew Lloyd Webber, a man whose name is synonymous with popular musical theatre. For me, this format of separating these two very different composers made the concert feel like two different shows, separated by an interval. This made for an interesting theatre experience. The first act felt like gently lifting the lid of a well loved, tin of liquorice allsorts. The second half felt like ripping the top off a box of Cadbury Favourites, and pouring the contents out to devour, with your friends! The first act opened with the rare and harmonious treat of seeing a full orchestra playing on stage. The orchestra, usually tucked away in the pit in stage musicals, don’t just accompany the singers, they shine as artists, clearly deserving of their centrestage status. It is glorious to have the musicians’ accomplished craft seen on stage and celebrated, under the masterful conducting of Musical Director Ravil Atlas. This awakening instrumental number was followed by the introduction of the large onstage chorus and soloists, during Cole Porter’s highly appropriate , “Another Op’ning Another Show”. This number, along with much of the first act, was injected with Staging Director Nickie Wellbourn’s quirky and animated style of direction. Wellbourn elicits audience giggles by providing deft comedic touches at perfectly chosen moments. This was clearly evident in Porter’s witty word play in the beloved classic, “Brush Up Your Shakespeare”. From the outset, the rousing, full bodied chorus is a delight to listen to. Together they achieve the most magnificent sound and each member of that large ensemble deserves individual recognition. The stage setting and lighting are simple, classic and effective, with a nod to the 1930s. The star studded backdrop and black catwalks serve as an unobtrusive canvas for the rich and diverse colour palette the soloists bring to the stage. There are 18 featured soloists in this concert and all of them do an outstanding job of honouring the works of these two composers. Each soloist brings something unique to the table, adding to the diverse flavours in this box of musical goodies. The first act had a few stand out moments for me. “So In Love” from Kiss Me Kate was one, performed tenderly by songbird Jaqueline Doherty, who on stage is the personification of vintage glamour. In Act Two Jaqueline also managed to capture the vulnerability and fragility perfectly, singing Lloyd Webber’s Memory from the Musical Cats. This young talent is one to watch and I’m excited to see what she will delight Christchurch audiences with in the future. Act Two exceeded all of my wildest expectations. It felt like Act One had been revving the engine and Act two took the brakes off and went for it. Fuelled by a combination of slick direction and pure talent, the cast powered through an intoxicating selection of spine tingling numbers. The driving energy of Act Two had the audience on the edge of their seats. The audience’s rapt attention was frequently evident in their appreciative applause (culminating in a rousing standing ovation at the end of the show), but there were also glorious moments of quiet contemplation. You could have heard a pin drop in the heavenly “Pie Jesu” when Amanda Atlas and angelic boy soprano Oscar Stove joined forces. Act Two offered stellar performance after stellar performance, every soloist making the Lloyd Webber songs their own. But for me, two performers were in a league of their own. Amanda Atlas brought the house down, singing “As If We Never Said Goodbye” from Sunset Boulevard. The best way to describe the brilliance of this performance would be to say that she sang and acted that song like it was the last time she was ever going to take the stage. Nothing was left in the wings, her soul was laid bare, and her vocal mastery and embodiment of the character was out of this world. Secondly, Nic Kyle’s performance of “Gethsemane” from Jesus Christ Super Star, was worth the price of the ticket alone. To understand the true power, and finely tuned craft of Nic’s voice, you have to experience it for yourself, and I highly recommend that you do! Broadway Hitmen is the ultimate opportunity to see world class talent, right here, on your doorstep. Like a box of Cadbury Favourites, there is something for everyone. But you better be quick, before they’re all gone! 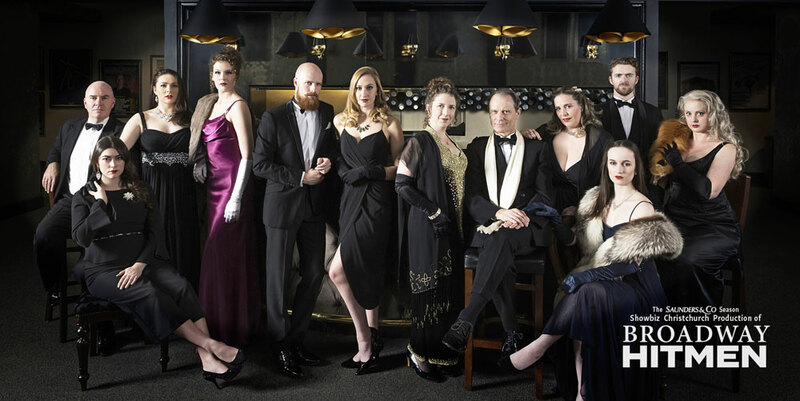 Broadway Hitmen is a show of two glorious halves, celebrating the iconic songbooks of two musical theatre legends - Cole Porter and Andrew Lloyd Webber. In the words of the latter: “there is so much to say here, not just today, but always” (from As If We Never Said Goodbye, Sunset Boulevard). These are indeed enduring songs from enduring talents, and Showbiz has taken the opportunity to remind us of just that. What is special about these concert performances - similar to the Rodgers & Hammerstein concert presented by Showbiz in 2017 - is that it is a veritable lolly scramble of the best bits of some of the greatest musicals in history. Without the distractions of such things as scenery, costumes, or choreography, the strength of the song and its ability to ‘stand alone’ is placed under magnification. It is also, equally, an opportunity for the singers to cut loose and flaunt their vocal abilities without the hinderance (or aid) of those same distractions. For most songs and performers in this Showbiz iteration, audiences will enjoy the result. In the first Act, Porter’s music reflects the glossy opulence of his own life in the early twentieth century in Europe, from musicals such as Kiss Me Kate, Anything Goes, and Can Can. Highlights from the first act included Jacqueline Doherty’s solo So In Love, which beautifully showcased the pure, ethereal tone in her voice. Also, the jazz medley of hits such as Night and Day, Begin the Beguine and I’ve Got You Under My Skin showcased the smooth-as-silk jazz-stylings of Leigh Wilson and Kate Taylor. Blair McHugh and Matt McMenamin added fabulous characterisation to their performances in Brush Up your Shakespeare, providing some welcome comedy as well. Anne-Marie Cotton and Warwick Shillito offered Let’s Do It in a charming, endearing performance, and Kira Josephson rounded out the first act with high-energy, terrific narrative, and a tap-dancing chorus line. What’s not to love about that? The second second act brings us the tip of the iceberg of musical smash-hits contributed to musical theatre history by Andrew Lloyd Webber. His talent and work has shaped the course of musical productions over almost 60 years. He holds records for the number of musicals simultaneously being performed on Broadway. But what becomes clear during the course of the second act is that Lloyd Webber’s music connects with, and expresses, the dynamic, complex, subtleties of the human experience. In these glimpses of some of the greatest musicals of all time, we hear songs of regret, memory, hope, farewell, grief, loss, joy, desperation, confusion, and mockery. We hear from such diverse characters as a cat, an Argentinian political leader, a disfigured musician, a diva, a woman from New York, and Jesus Christ. Jacqueline Doherty is a highlight once again, in her stunning performance of Memory from Cats. Charlotte Taylor shines in the challenging Think of Me from The Phantom of the Opera. Catherine Hay delivered heartbreaking emotion in Tell Me On a Sunday. There are three stand out performers from the second act, however, that may well have stolen the entire show. The first is Oscar Stove, who sings the boy soprano part in Pie Jesu. Joined by Amanda Atlas, there was surely not a dry eye in the house. Amanda Atlas is also the second highlight. Her phenomenal performances in both Pie Jesu and As If We Never Said Goodbye demonstrated power and expression in her voice that was only matched during the evening by Nic Kyle. Kyle commanded the stage in each of his outings, and also when supporting other performers. His performance of Gethsemane was jaw-dropping, and the emotional climax of the evening. Another enjoyable aspect of the concert format is that the orchestra joins the vocal performers on-stage. Music director Ravil Atlas led this excellent on-stage orchestra and chorus of over 50 additional voices to support the brilliant solo vocal performances, and even had some humorous interactions with the soloists in one or two of the pieces. I would just question the tempo of the finale Superstar, and wonder if a slower pace would have supported the singers to get a better command of the piece rather than clearly struggling to spit out their words - and thus a stronger ending to the concert. Two musicians stood out for their contributions - Georgina Rees-Stevenson for some fine recorder-playing, and Sarah McCracken on violin for some stunning, supportive solos and leadership in the string section. The whole group of musicians are quite phenomenal, and it is a treat to see them working their magic more closely - a point I find myself wanting to emphasise towards audience members who decide to leave before the orchestra have finished playing at the end! How outrageous and disrespectful! Bravo and thank you to Atlas and the orchestra for a fine evening. Praise should also be offered to the sound technicians, for managing what is clearly a complicated and changeable aspect of the production, particularly in the opening number with so many singers requiring cues on different microphones. Well done also to Nickie Wellbourne for devising a staging plan that allowed performers to move freely around and through the orchestra, which added interest in such a static performance. Showbiz Christchurch’s Broadway Hitmen is, at once, both enchanting and emotionally charged, featuring performances that could easily be at home on Broadway or the West End. It is a reminder, once again, that our local talent pool is - in the words of Lloyd Webber - “bigger and brighter than we knew it”. There is definitely magic in the making here, and audiences should make sure they don’t overlook this gem in the 2018 season.